Standing directly beneath the cliff face is dangerous. Please do not venture off trails or past the viewing platform. Interpretive information is available at the parking area and along the short trail to the base of the cliff. Bring your own drinking water, as potable water is not available. Driftwood Canyon is recognized as one of the world’s most significant fossil beds. It provides park users with a fascinating opportunity to understand the area’s evolutionary processes of both geology and biology. The day-use area is open from May 15 to September 2. To ensure that future generations may study and learn more about our earth’s history, BC Parks asks for your co-operation in refraining from removing any fossils. The fossils are more valuable in the ground than they are exposed to the elements of erosion, which spoil their scientific and educational values. 10 km northeast of Smithers, follow the signs on Old Babine Lake Road. The closest communities, towns and cities are Smithers and Telkwa. Any maps provided are for information only – they may not represent legal boundaries and should not be used for navigation. Culture: Driftwood Canyon Provincial Park lies within the traditional territory of the Wet’suwet’en people. History: This park was established in 1967 to protect the fossil beds on the east side of Driftwood Creek. A portion of the park land was donated to the province of BC by Driftwood Canyon resident Gordon Harvey, who had a keen interest in the fossils at this site. Gordon Harvey performed the role of park interpreter in the early days of park establishment. Preserved within the shale formations are plant, animal and insect species that inhabited the area over 50 million years ago. Approved Driftwood Canyon Provincial Park Management Direction Statement [PDF]. Because of the large size of the maps, they are listed separately. There is a short trail that leads from the parking area to the fossil beds. Along the trail are signs that provide information on fossils and local history. There is also a viewing platform over Driftwood Creek. For your own safety and the preservation of the park, obey posted signs and keep to designated trails. Shortcutting trails destroys plant life and soil structure. Campfires are permitted at this park but visitors must provide their own wood. To preserve vegetation and ground cover, please don’t gather firewood around the day-use area or elsewhere in the park. Dead wood is an important habitat element for many plants and animals and it adds organic matter to the soil. You can conserve firewood and air quality by keeping your campfire small. 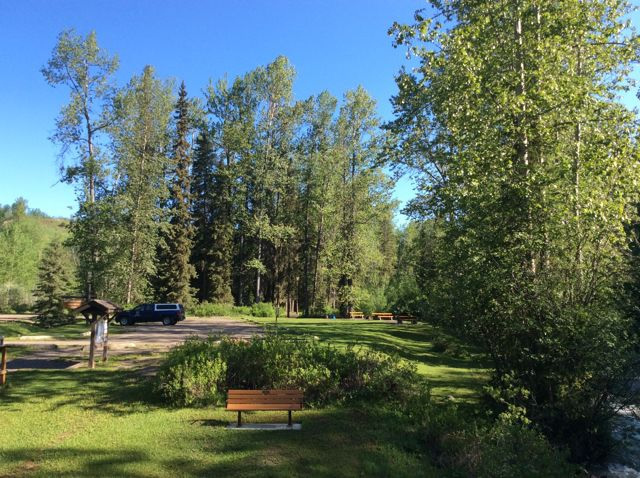 There is a day-use/picnicking area beside Driftwood Creek. It is a grassy area with picnic tables and fire pits. There is a moderate sized parking area available for vehicles to park. The day-use area is open from May 15 to September 2. There are two pit toilets located at the day-use area. The interpretive trail and one of the pit toilets are wheelchair accessible.